HomeBrowse LibraryIs Your Small Business Prepared for a Lawsuit? Business owners must be keenly aware of their financial risks—and the threat of being sued could be larger than you realize. The financial hits of litigation can be far more damaging to small businesses than to large ones, which often staff in-house legal counsel and devote a portion of their budget to legal defense. According to a Small Business Association Office of Advocacy report, the cost of litigation for small firms can range anywhere from $3,000 to $150,000. And it's not uncommon, in fact, a poll found 43 percent of small-business owners reported having been threatened with or involved in a civil lawsuit. Business owners who've had to pay legal damages say the costs nearly put them out of business. But the effects of litigation could go far beyond a direct financial hit. A lawsuit can harm your business's reputation, especially if it paints your business in a negative light and is publicized by local or national media. It can also put stress on you and your employees. Small businesses are sued for a wide variety of reasons, from breach of contract to product defects to employee relations to noncompliance with federal regulations (such as the Americans with Disabilities Act). Company doesn’t follow its own policies. Of course, sometimes lawsuits are warranted, but other times they may seem frivolous or even unjustified to the business owner. Unfortunately, the validity of the lawsuit may have little effect on how much time and money a business must spend defending itself, unless perhaps the judge throws out the case. Take the right steps to reduce the financial repercussions on both your personal and business finances should litigation become necessary. Incorporate your business in a way that shields your personal finances from any legal claim, and obtain the right business insurance coverage to protect your company's finances. General liability insurance, for example, protects you for a range of potential claims against your business, such as someone slipping on your property or accusing your business of false advertising. Specialized liability policies can be designed around the unique needs of your business, when necessary. It may seem obvious, but you can get yourself in trouble by over-promising or making grandiose claims about your business and capabilities. In general, steer clear of saying anything both publicly or privately that could come back to haunt you. For example, refrain from making overly specific claims about your products or services that could be disputed. Chipotle was sued by customers who felt "excessively full" after consuming a supposedly 300-calorie burrito and then questioned the veracity of Chipotle's nutritional claims. On the employee side, make sure to have clearly stated policies—in an employee handbook—that promote fairness and clearly explain the rules and how specific difficult situations will be handled. Before you find yourself in legal hot water, have a reputable and informed lawyer on call to counsel you on how to prevent matters that could lead to legal trouble for your business (whether that's employee practices, product or general liability). This person should be the one you reach out to if potential legal troubles arise, with the goal being to avoid a full-blown lawsuit. If someone does sue your business, or threatens to sue, take the following steps to hopefully improve the outcome for your business. Contact your trusted lawyer immediately—ideally before a suit has been filed or any formal action has been taken. Your lawyer should guide you through the best course of action for either deflating the situation or ensuring you handle it properly. For example, your lawyer may guide you on how to address the person threatening to sue or may advise you not to have direct contact with that person at all. Be sure to keep complete records about the person or entity threatening to sue and the situation at hand. You may be asked to present that information later. Contact your insurer. They will guide you through the process of filing a claim. Don't panic. While facing litigation is nerve-wracking, if you're on the right side of the law, it's in your best interest to stay optimistic and focus on continuing to run your business as best you can. 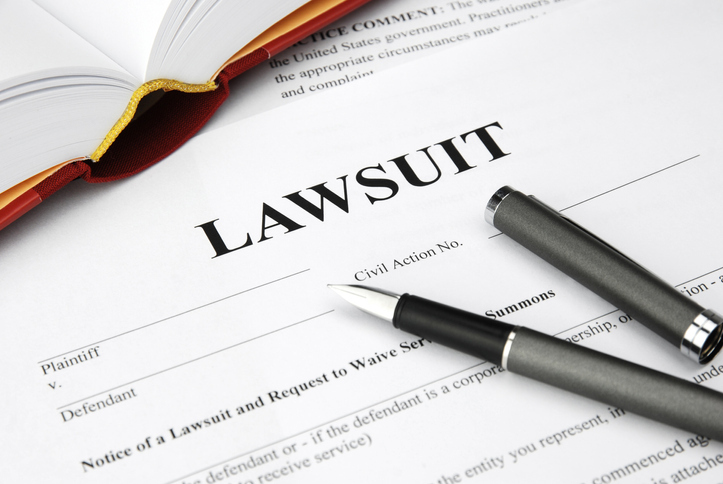 Take the right steps to protect your company from the business and financial risks of a lawsuit. This will not only give you piece of might but may just save your business in the future.